Appearing continually in El Expreso Newspaper, and in other communications media, are the names of the principal banana exporters, which are: Dole, Chiquita, Bonita or Exportadora Bananera Noboa, Excelban, Del Monte, Favorita or Reybanpac, Derbi, Bonanza or JFC, and still others. Nevertheless, only Bananera Noboa is mentioned by the communications media as the company owing to the Treasury. Bananera Noboa owes nothing to the Treasury. In the year 2005, Bananero Noboa had a revenue of US$ 1,219,851 dollars, and paid US$ 259,218 dollars in taxes. Ubesa or Dole paid less than that, and less than that was paid by Chiquita, Del Monte, Reybanpac and other companies. In that year, Bananera Noboa was the foremost banana exporter in the country, nevertheless, for the year 2005, Bananera Noboa received an assessment – and the amount is risible – to the amount of US$ 226,669,000 dollars. None of the other exporters I have mentioned here have received an assessment, nor anything similar. This, Ecuadorians, confirms for you that this is nothing more than persecution; neither they nor I should receive such an assessment. A disproportion of almost 300 times against Bananera Noboa, compared to the other exporters cannot exist. On the other hand, I am tired of them saying that Álvaro Noboa owes the Treasury. 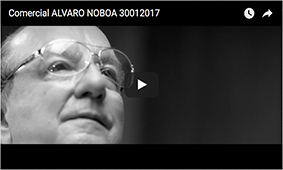 Álvaro Noboa is on the white list of the Treasury as one of the foremost payers, and one of the best payers. You can see, via the Internet, the IRS Certificate stating that Álvaro Noboa is on the white list, the same as Industrial Molinera, and the other businesses belonging to the Noboa Group: they all pay taxes. With this, Ecuadorians, I hope to have cleared my good name, which I aim to keep, in honor of Ecuador and my children, until my demise. Thank you very much, Ecuadorians.